Creating a gluten-free dough that met Eli’s standards of excellence was quite a challenge. Our results were worth the effort. 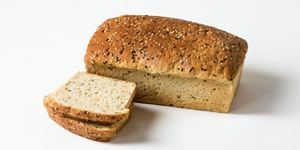 Good by all the standards we measure bread by; these loaves are laced with sesame, millet and flax seeds, keep well and even toast well. *This dough is made in and shares equipment with other bakery items so it is not appropriate for people with celiac disease.